This, fortunately, is more baldly meta than the bulk of the novel, but it does form a place to begin. 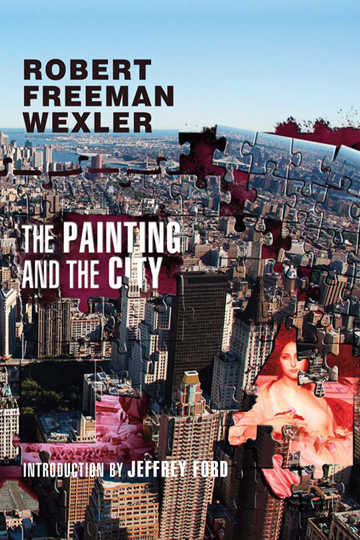 The Painting and the City is in fact Robert Freeman Wexler's second novel, following the hopeful and surreal The Circus of the Grand Design (2004); also relevant are the novella In Springdale Town (2003) and a chapbook collection of short fiction, Psychological Methods to Sell Should Be Destroyed (2008). These previous works tended to be stories of leave-taking and escape, where, abetted by surreal locations, solitary protagonists achieve a measure of self-awareness and a sense of their own ability to make choices. Wexler's new novel maintains a focus on character and on the surrealism of place, but breaks from the past in rejecting escape and in encompassing a scope greater than its individual protagonist. The Painting and the City is a novel about reaching an accommodation with the world that allows an individual to remain in a place—and about how easy and how dangerous false accommodations can be, for individuals and for the world. We begin in early 2001, the hopeful dawn of a new millennium. Jacob Lerner is a young sculptor finding his way in the New York City art scene, a lone artist—as he sees himself—against the forces of commerce. At the aforementioned party Lerner also encounters a nineteenth-century painting of a woman of mixed African and French descent, with an ominous figure in the background. Entranced by the portrait, Lerner tracks down the journal of its Dutch-English painter, Philip Schulyer. This journal, presented as a found document, contains Schuyler's account of being brought to New York in 1842 by a secret society devoted to preserving commercial interests dating from Dutch colonial times. The portrait Schuyler is commissioned to create is, he learns, part of an occult rite to harm its subject, who Schuyler calls Madame Burgundy, and punish her society-member husband for marrying outside his race. Schuyler makes an effort to disrupt the ritual, and escapes through the aid of his acquaintance Charles Dickens—who was in fact in New York in 1842 as part of his first American visit—and through an odd intrusion of contemporary Manhattan, its concrete streets, its taxi cabs, and a glimpse of a man who looks just like Jacob Lerner. Back, then, to Lerner, who increasingly experiences New York through a kind of double vision, an overlapping of the City's past and present. Visions and history of nineteenth-century Manhattan form an increasing influence on his sculptures; yet his sculptures begin to anticipate contemporary events, muddling cause and effect, correlation and causation. Eventually, Lerner's obsession with discovering the fate of Schuyler brings him into contact with an autonomous Angela Carter-esque marionette made of red glass, who enlists Lerner and his art in a struggle to undo the damage wrought on Manhattan's natural landscape by centuries of commercial urban development. Certainly one highlight of The Painting and the City is the city—the cities—that Wexler has built, the surreal aesthetics of their construction. Wexler captures the surrealism latent in the modern city: the odd juxtapositions; the hyperawareness of constant change; the sense that anything can happen. His amplification of these intrinsic qualities is, at first, subtle—the gradually dawning perceptual wrongness of Magritte's Dominion of Light rather than the flamboyant distortions of Dalí (or the blatant absurdism in several of Wexler's own short stories). The earliest hint of Wexler's surrealism is simply an organic, layered density—the thickening of a thinned world—that emerges from the humid New York City summer to impede the urban impulse to stay in motion, obscure the city's surfaces and isolate its denizens, violate the idea of the city as a shared experience. Gradually, Wexler builds on this, with trompe-l'œil moments where we cannot be sure whether the writing refers to a model of the city or the city itself, metaphors that just might be meant literally. Lerner's hallucinatory visions of the past and the layering of New York's history via Schuyler's journal combine to emphasize the constructed quality of the City. Eventually we encounter blatant impossibilities and absurdities that seem expressly designed to confound attempts at rational understanding, perhaps to remind us not to try. The overall effect is to render contemporary New York a tablecloth constantly in danger of being yanked from the table. Balanced against this surrealism is the vast sympathy that Wexler displays towards his characters. Jacob Lerner is a learner, like many Wexler protagonists intent on deciphering the strange events he has become part of in an unsympathetic world. Lerner is not always likeable: in the throes of obsession he can be a bit of a jerk; he has an artist's mix of ego combined with lack of confidence in the power of his own work, which can lead him to be gulled; and he often displays a hypocritical righteousness. He's quite willing to damn his friends as "corrupted [by commerce] . . . but not monstrous, no need to shun" (p. 220) while himself displaying the expediency of an anti-commercial artist who must sell his art. And although his goal is to create art that "breaks the barriers of hate, of racist fear" (p. 14), he's startlingly unthinking about the fact that Native Americans inhabited Manhattan before the Dutch settlers—to the extent that one wonders whether Lerner knows the story of Peter Minuit's famous purchase. Lerner does make one mention of "local tribes" on the island before the Dutch (p. 204), yet his conception of Manhattan's history is summarized, "From each collapse a new civilization arises. The English replaced the Dutch. . . " (p. 144) and he sees Amsterdam as the "birthplace of New York" (p. 265). Despite his irrationalities, however, Lerner's heart is generally in the right place, and he continues to persevere no matter how odd and quixotic his quest becomes. He even shows a welcome sense of humor in his habit of inventing absurd stories when entrapped in annoying conversation. And an extended scene of Lerner trying to convince himself to get out of bed in the morning is both laughably endearing and also hints that his moral absolutism is affected to a degree for self-motivation. In a moment of reflection late in the novel, Lerner concedes that his shunning of commerce in favor of art "didn't mean he would always choose one and shun the other. Life was more complex than that. Humanity, he hoped, was more complex" (p. 246). Springdale , Circus , and many of Wexler's short stories feature protagonists driven to escape. And Philip Schuyler, whose epistolary narrative occupies a fifth of this novel, is in some ways the traditional Wexler protagonist, escaping through increasingly surreal settings that we see through the windows of his journal. But Lerner is different. He knows and appreciates the good aspects of New York City, its energy and variety, and repeatedly rejects leaving. His desire is instead to move his city towards a balance "where art or learning might be more appreciated" (p. 239), to transform New York. Inevitably in attempting this Lerner is himself transformed; The Painting and the City is very much a chronicle of the linked processes of artistic creation and transformation. Like Steven Brust's The Sun, the Moon, and the Stars (1987), Wexler's novel mixes urban life with the fantastic to present a study of the character and mindset of the young-and-serious artist. It chronicles how external events can directly or subtly inform an artist's works, and how seemingly small occurrences can spur an artist to attempt new heights. There are also similarities to The Portrait of Ms. Charbuque (2002) by Jeffrey Ford (who contributes a fine introduction to this novel, for all that PS Publishing's practice of including such introductions strikes me as a bit odd) in its mixture of art, New York history, and a pulpish sort of horror; and to Jeff VanderMeer's "The Transformation of Martin Lake" (1999), with which Wexler's book shares a red/green color coding, an appreciation for the art of Scott Eagle, and a beheading. Part of what these works convey is how the questioning and deciphering of the world that goes into creating art is itself experience, perhaps unique to the artist, that can be transformative. Lerner begins the book sculpting a variety of clay and bronze cages ("Lerner had done cages years ago, moved to other themes, and returned." p. 9); he is artistically in a cage and in the past. By the novel's end we have watched Lerner's art, fed by the need to process the odd happenings he has experienced, expand to mixed-media portrayals of large swaths of both civilization and nature. He has left his cage: The Painting and the City chronicles an escape of a different sort. Voices mingled. Clinical discussions of imagery, or technique. . . but. . . what of the woman, the sweet, unsuspecting woman [in the painting]? "Jacob. Jacob. . . are you okay?" For all that the novel includes and for all that it radiates this sort of self-awareness, it is ultimately an absence in the book that comes to figure most centrally in our awareness as its readers. The Painting and the City ends in August 2001, a mere month before the September 11 attacks that included the destruction of the World Trade Center towers in New York City. Other than a few ambiguous indicators, Wexler studiously avoids belaboring what the combination of time and place will mean—which makes the feeling of oppressive immanence all the stronger. We read the novel through disaster-tinted spectacles. There is the natural thought that this looming absence might render the events of the tale inconsequential. What the suggestion of 9/11 on the horizon does for a story so caught up in New York's past, though, is bracket Lerner's quest in time and affix it there. The instauration, however small, that Lerner achieves with the knowledge he has gained is not something that will be erased by the events that will follow. The sense, the hopeful sense, of the novel thus becomes that victories are not so much temporary as they are temporal, existing forever in their own moment. For Lerner, this may prove little consolation. Unlike several of Wexler's past protagonists, Lerner never quite reaches understanding within the story, and we can but wonder what his reaction will be when understanding arrives. September 11 is a line of division between hopeful and happy, and both a slingshot and baited trap for Lerner given the final sculpture he completes in the book. But for the reader, it gives everything in the story an added depth and resonance. We know, as Lerner does not, that the thickening of the world he perceives has a scope greater than his personal quest for understanding. The Painting and the City is not a novel of understanding events or of coming to conclusions. It is notable not so much for accurately representing complexity—trying to read the book that way lies madness—as it is for refusing to make sense, refusing to untangle Lerner's often contradictory and gap-filled progression of artistic ideas into something that we can point to as containing answers or even a conceptual framework for answers. And what it does represent is an imprint of human feeling: of power and responsibility, knowing and misunderstanding, complacency and fragility. In the wake of 9/11 many people described the day's events as surreal; what now stands out is how real the world became that day. But how strange and surreal must the months before the attacks appear now in retrospect to those who lived in New York for any length of time? That is the surrealism of The Painting and the City .